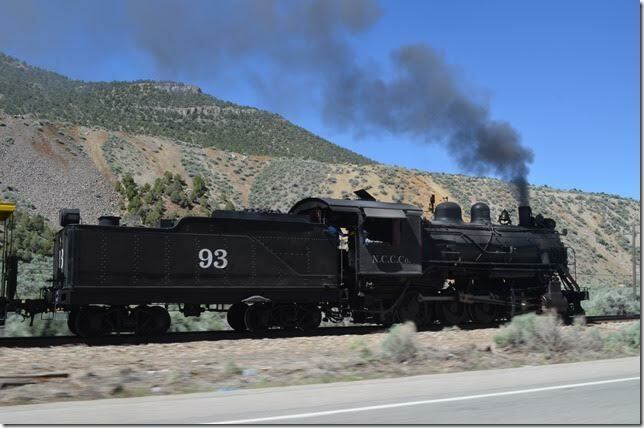 We departed Ely on Sunday June 19, 2016 by following the 9:30 AM steam excursion. 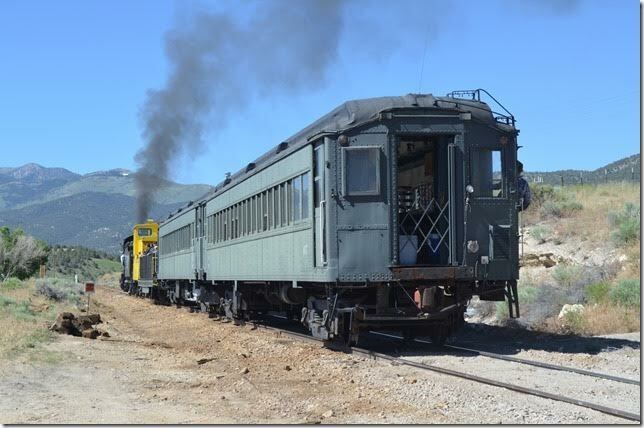 The 1:00 PM train was diesel powered. 1. The second floor bay window contained the NN’s dispatcher’s office “in the day”. 3. The former freight station. 4. 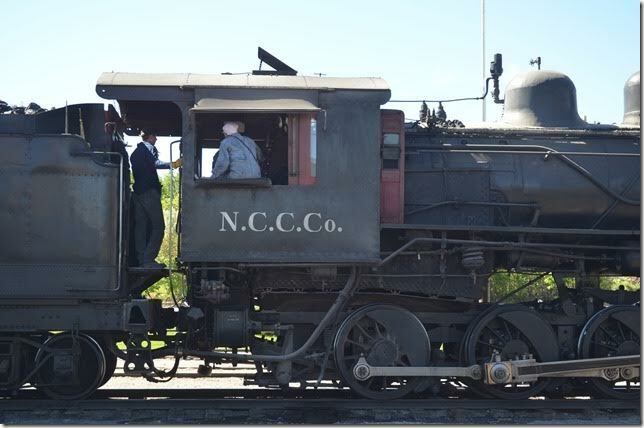 N C C Co engine cab. 5. 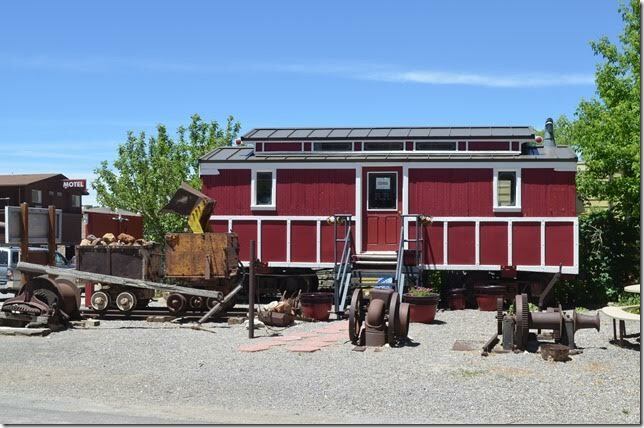 I could do without the caboose behind the engine. 6. 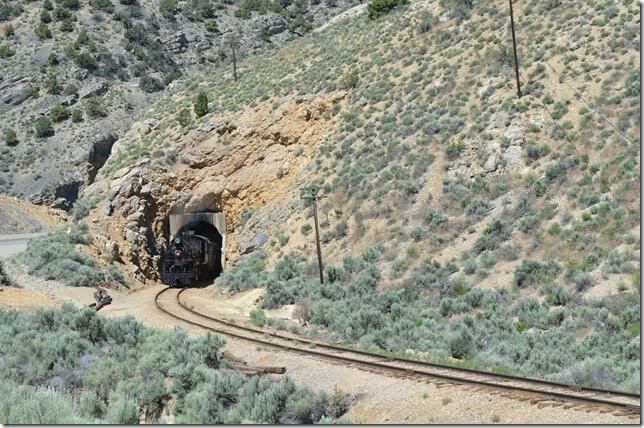 Along the “ore line” on the hill above downtown. 7. The coaches are former Illinois Central commuter cars. 8. Heading into the tunnel. 9. 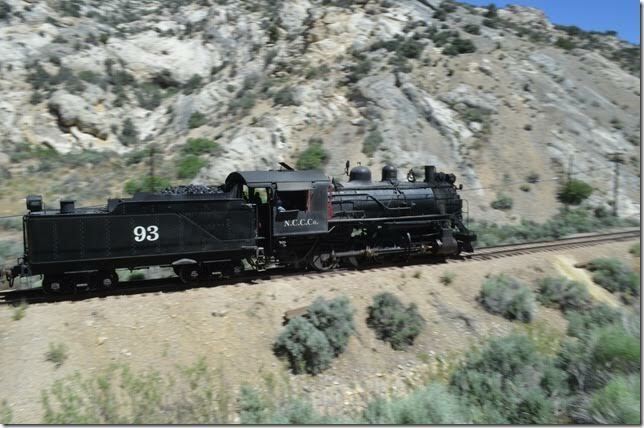 No 93 going thru the canyon. 12. Pacing along US 50 at Lane. On the return trip Sue got a movie with here cell phone! 13. 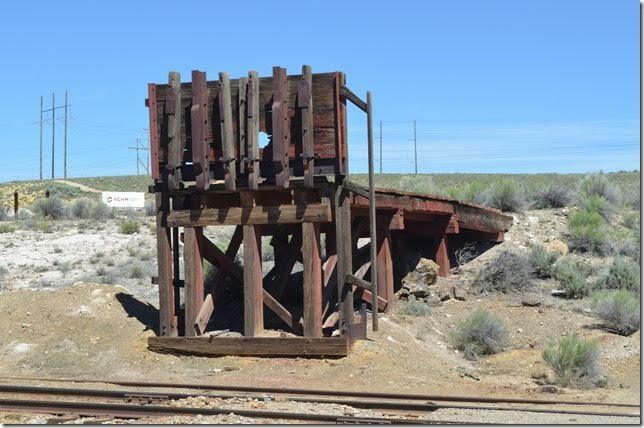 Ramp used by independent miners for loading ore at Keystone. 14. 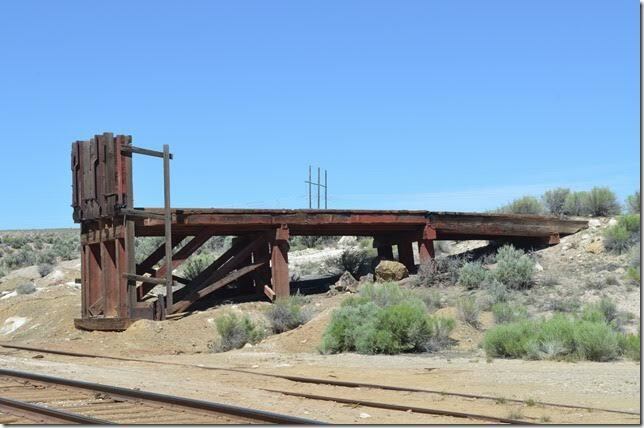 Ramp used by independent miners for loading ore at Keystone. View 2. 15. I hoped they would run around their train, but they didn’t. Appears to be a telephone booth on the left. 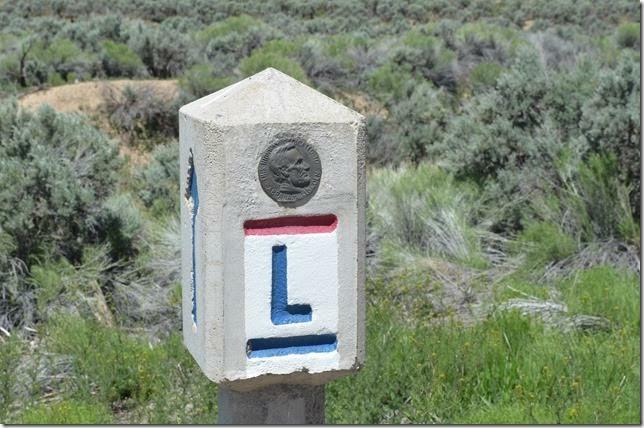 Keystone is at MP 145.8 from the junction with the old SP at Cobre. I don’t know how much of the line from McGill Junction north is intact. 16. 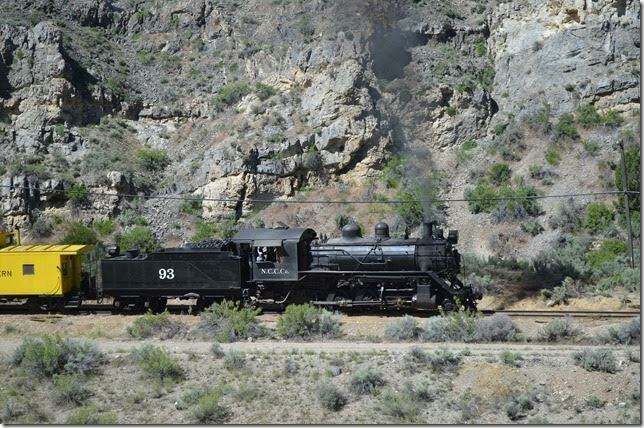 Coming on up the canyon. 17. 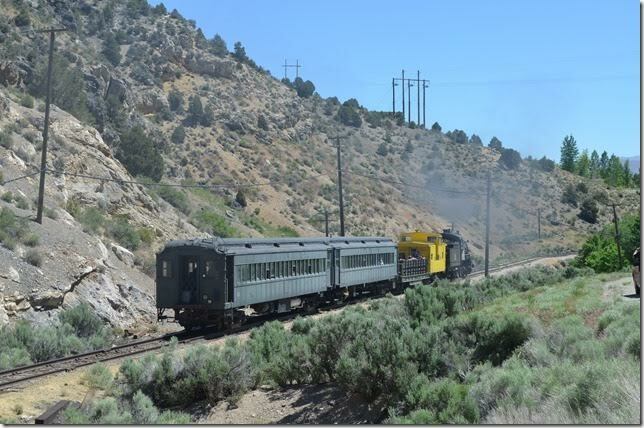 Passing the siding at Lane, MP 143.8. 18. Just coming out of the tunnel. 19. Out of the tunnel. 20. 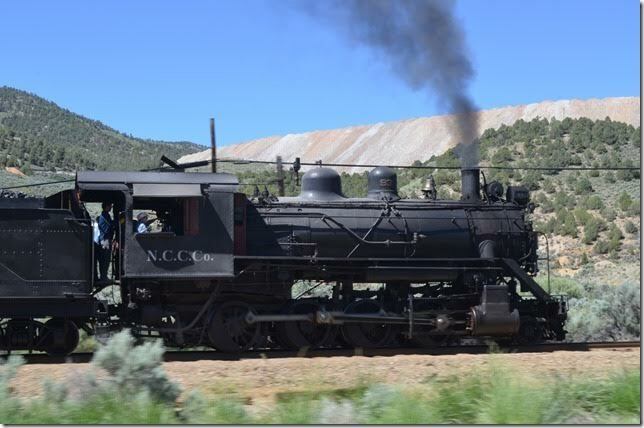 Engine and coal tinder. View 2. 21. The original main line through town would have diverged to the right somewhere in this view. 22. US 50 is dedicated in these parts to Abraham Lincoln. 23. 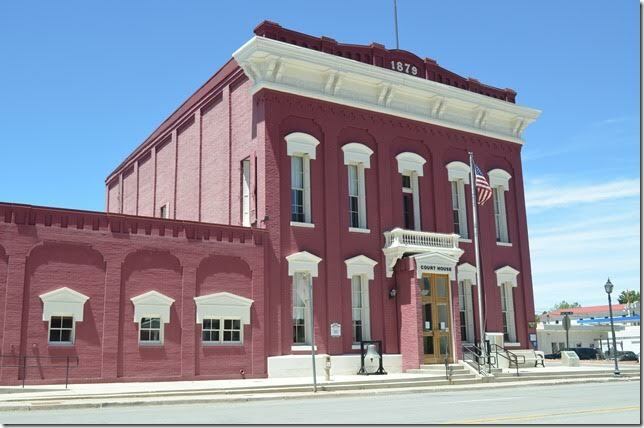 Eureka County court house in Eureka NV. 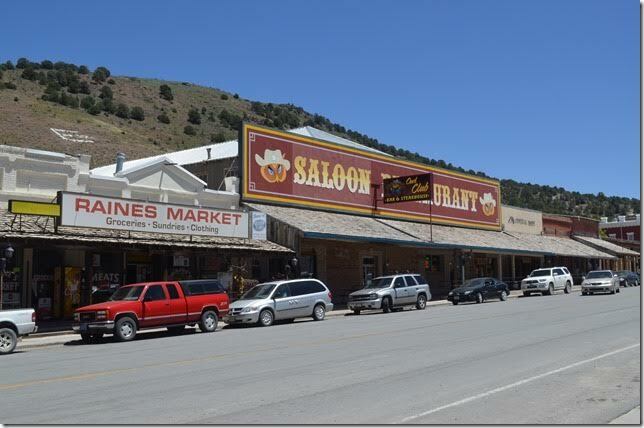 Eureka is a historic mining town on US 50. Read about it at www.EurekaCounty.com. 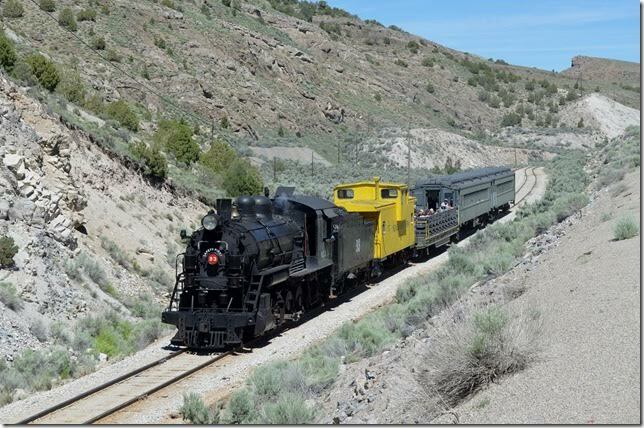 Like the Nevada Northern, the Eureka & Palisade Railroad came south with a lengthy 84-mile line from the SP main at Palisade. 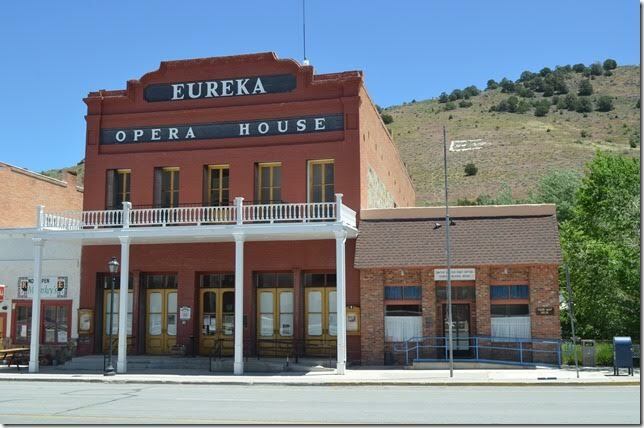 Quite a few structures are still standing in Eureka. 24. The opera house and post office. 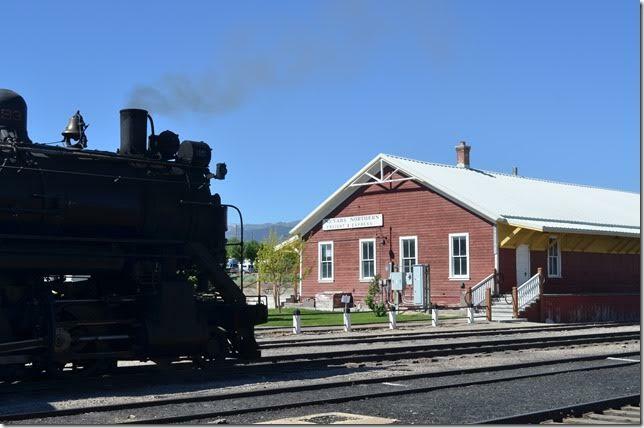 The building was built in 1880. The county purchased and restored it in 1993. 25. 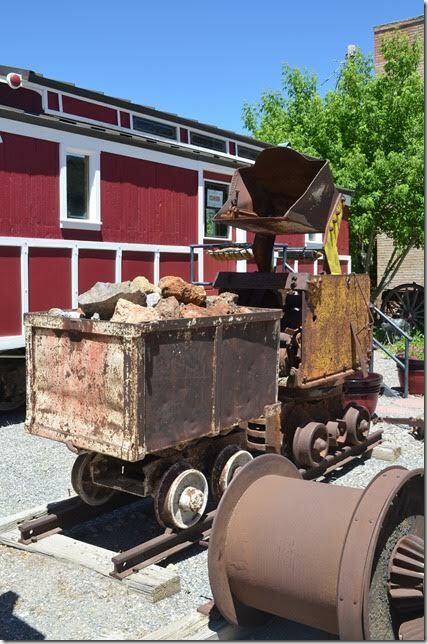 Surrounded by various mining implements, this “crew car” is the only item of the abandoned Eureka & Palisade Railroad that survives. It is now an economic development office. The E&P was abandoned in the mid-1930s. 26. That yellow thing scoops the ore and dumps it into the car behind. 27. The Owl Club is the place to eat! I got a huge hamburger and a pile of fries with an ice tea. The service is great. 28. 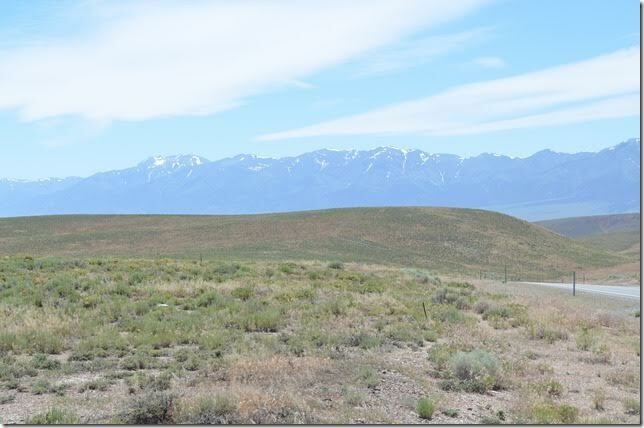 Looking at the Toiyabe Range between Eureka and Austin. Yes, that is snow. 29. 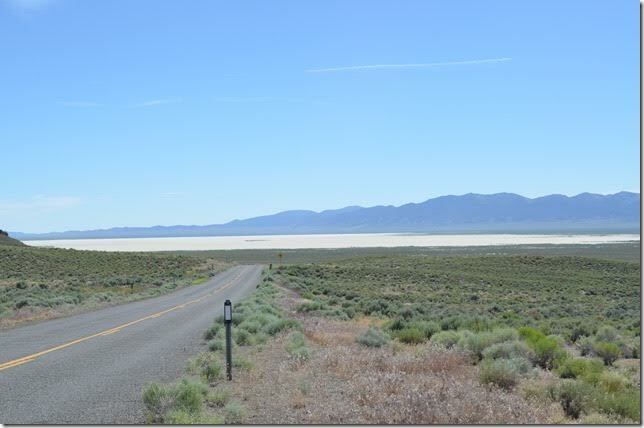 Looking east at US 50 where it crosses the Big Smoky Valley at the intersection with NV 376. 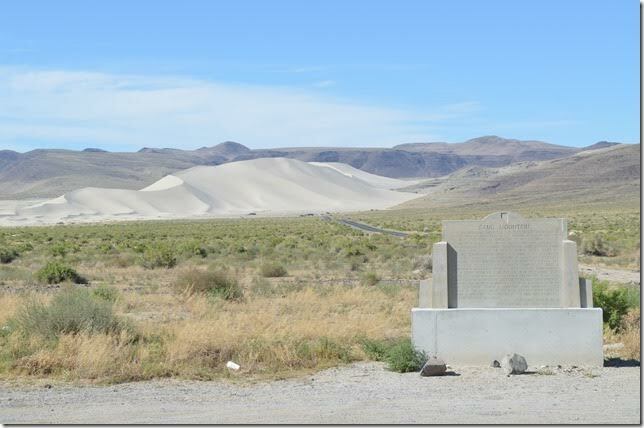 US 50 is called “America’s Loneliest Road” in Nevada. No argument on that. 30. 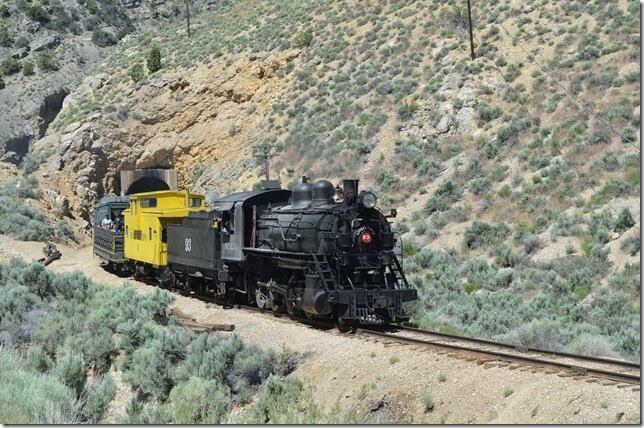 Dropping down the steep mountain into Austin NV. 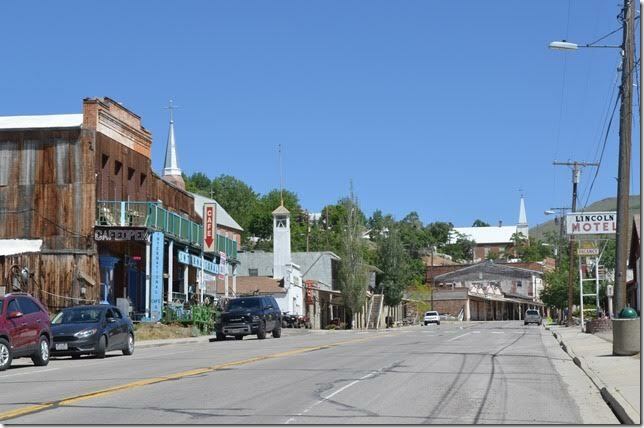 Austin is another small but historic mining town. 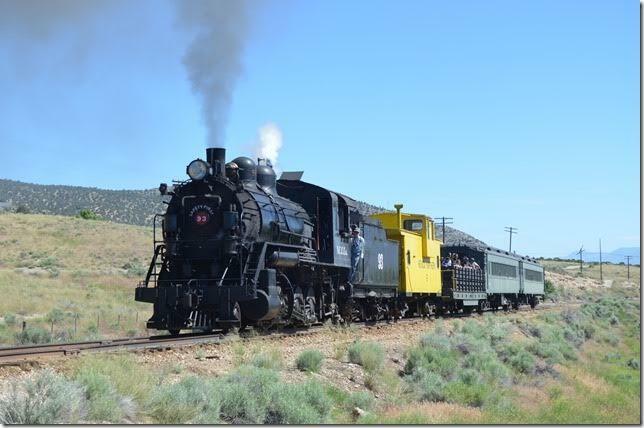 Like the other short-lines, the Nevada Central came off the SP. 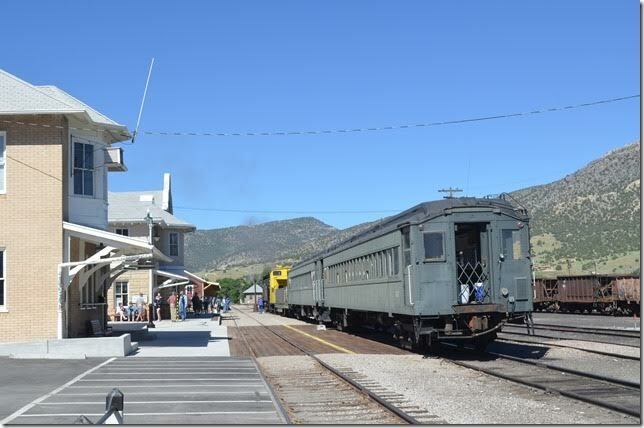 It operated from 1880 until 1938. 31. Looking east on US 50 in Austin. Read about it at WWW.AUSTINNEVADA.COM. 32. Leaving Austin we took NV 722 on advice that it was more scenic. This is a huge “lake” of sand or salt. 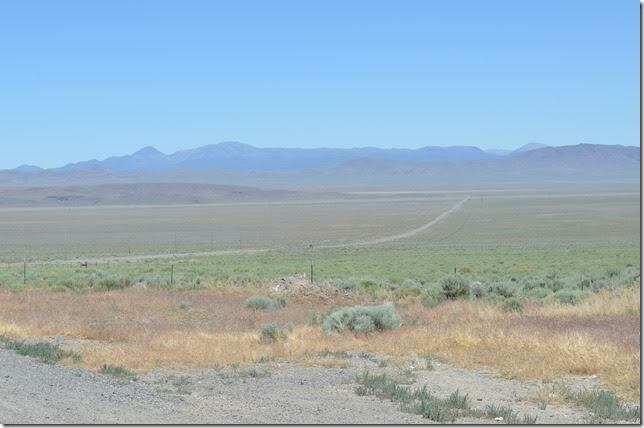 In those 53 or so miles on NV 722 until we reached US 50 again, I remember seeing only three vehicles! Not a place you would want to have a breakdown. 33. 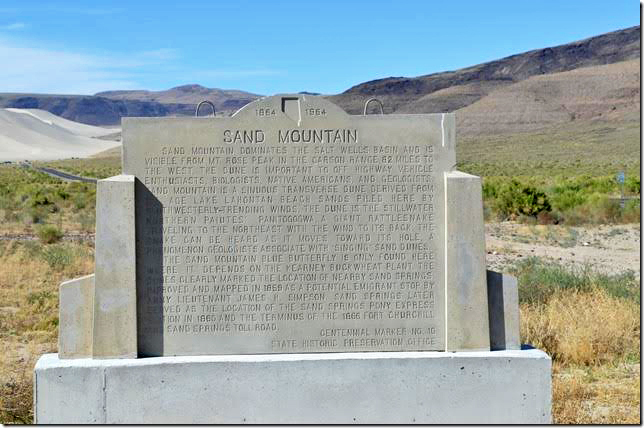 Sand Mountain National Recreation Area is about 24 miles east of Fallon. 35. 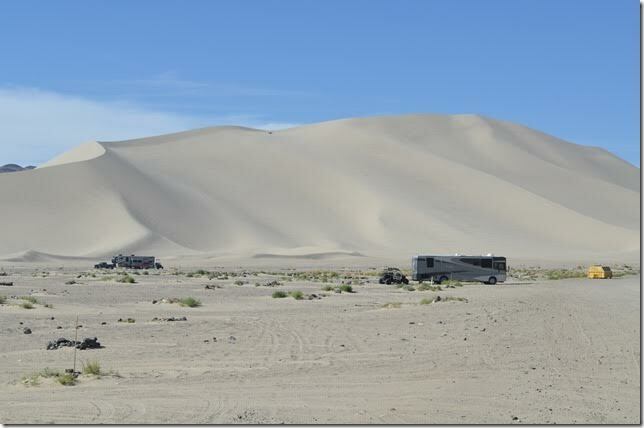 In Nevada you’re far from beach, but you can get sand on your feet here. Fallon is a rather large town. We stopped in the first Wal-Mart we had seen since leaving Las Vegas on Thursday. People in Austin told us that they go to this Wal-Mart for groceries...111 miles one way! 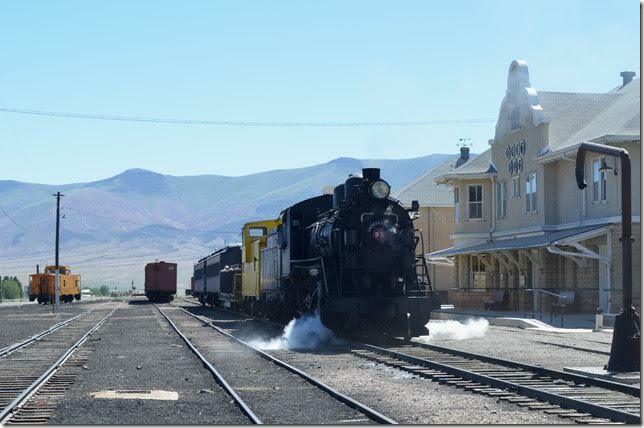 The former SP came into town from the main line at Hazen. 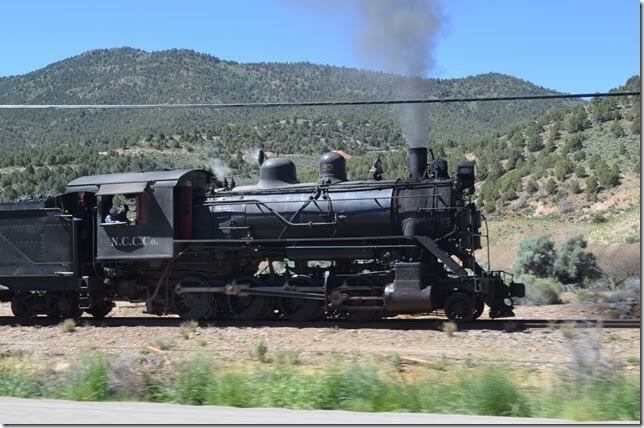 Heading on west on US 50 we encountered a UP (ex-SP) branch that was originally the old Nevada & California and Carson & Colorado (narrow gauge). 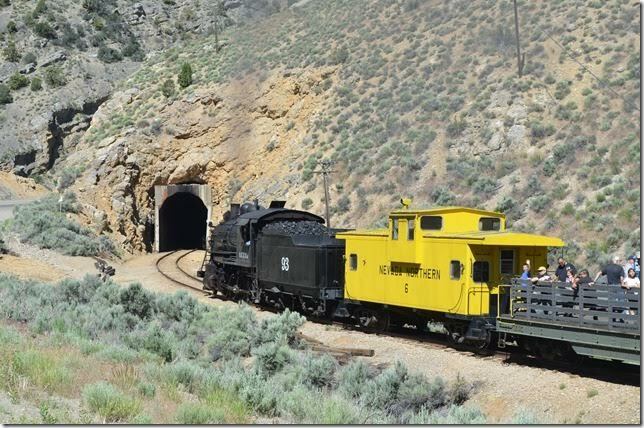 UP operates the track down to Wabuska and the remainder south to Hawthorne by the Department of Defense. Hawthorne is the U. S. Army’s largest ammunition dump. 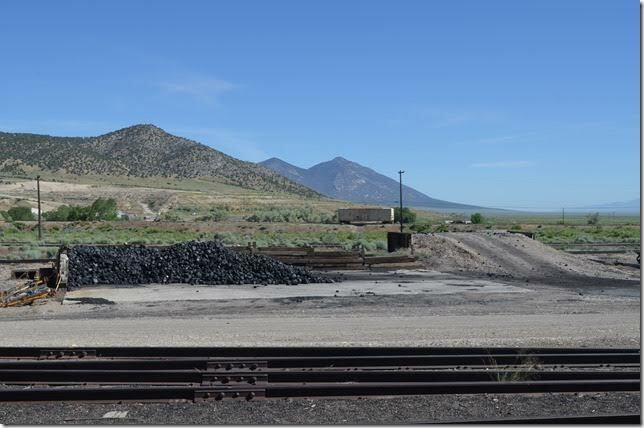 All of the railroads south of there to Las Vegas are gone. 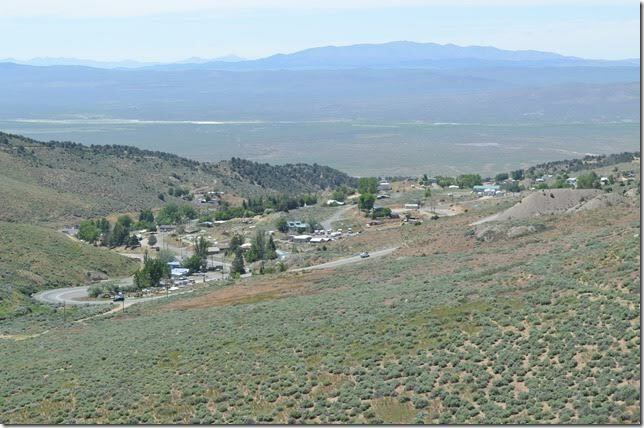 US 50 became 4-lane and the drive into Carson City was easy. 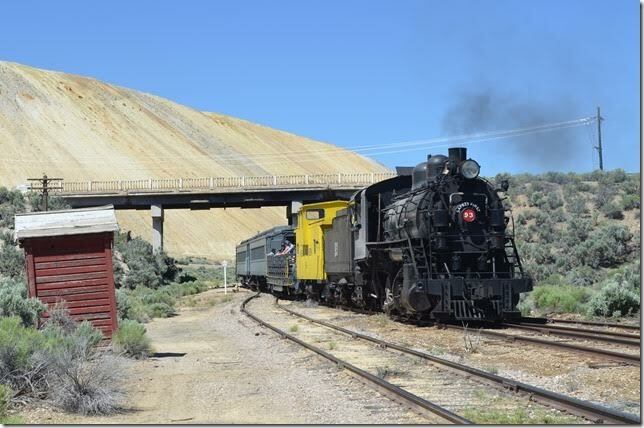 A new overpass proclaimed Virginia & Truckee Railroad. Nearby we found the Eastgate depot, and I picked up a schedule. 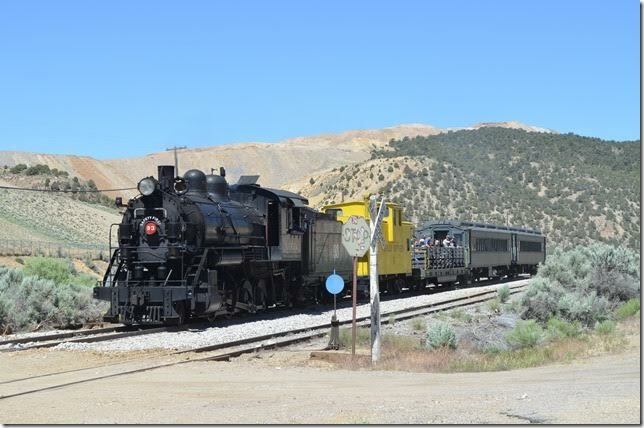 A ride on the V&T was now on the itinerary for our visit to Virginia City.